The Dingle Way is one of over 30 long-distance walking trails in Ireland, but one of only three that has an international reputation among walkers, hikers or trekkers as they variously describe themselves. One of the other internationally-renowned Irish walking trails is the famous Ring of Kerry in the south of the county, and the other is the Wicklow Way stretching from the mountains south of Dublin city, through county Wicklow and finishing in county Carlow. Situated in the south-west of the Ireland, the Dingle Way completes a circuit of the Dingle Peninsula, starting and finishing in Tralee, the county town of Kerry. The trail is 179 kilometres long and takes an adult who is reasonably fit an average of 8-9 days to walk. 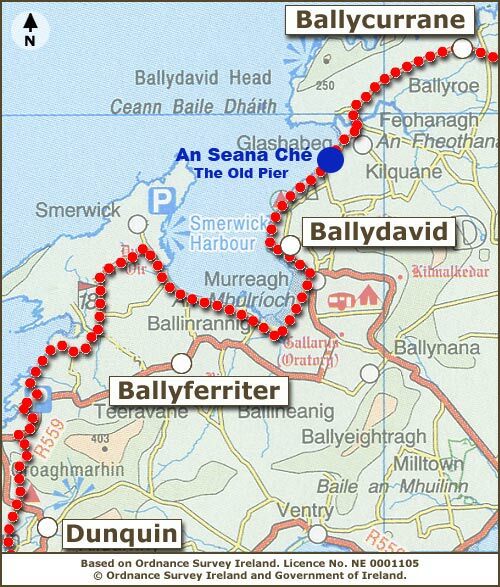 As you can see from the map below, the Old Pier B&B and Seafood Restaurant is situated perfecly on the Dingle Way itself. At the north-west tip of the Dingle Peninsula, small townlands start to merge with one another. Feohanagh and Cuas are two of these that have small dispersed communities. There is very little in the way of public facilities with just two pubs that are several kilometres apart. 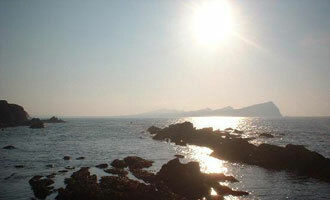 Brandon Creek can be found near Cuas and is reputed to be the place from where Saint Brendan set sail across the Atlantic Ocean to discover North America in the 6th Century. This journey was simulated in 1976 by Tim Severin when he also set sail from Brandon Creek in a similar leather skinned vessel to prove that the feat was possible. He completed his sailing to land in Newfoundland. Looming over the communities of both Feohanagh and Cuas is Mount Brandon. The Dingle Way traverses the saddle between it and Masatiompan.